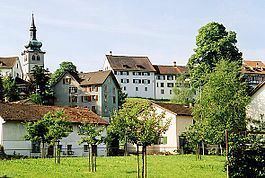 Bischofszell is a municipality in Weinfelden District in the canton of Thurgau in Switzerland. It is the seat of the district. In 1987, the city was awarded the Wakker Prize for the preservation of its architectural heritage. So was its neighboring city Hauptwil-Gottshaus in 1999. A Bronze Age Tumulus, scattered Roman and Alamanni items and Early Middle Ages documents provide evidence of earlier settlements. It was probably founded in the 9th Century by the Bishop of Constance Salomo I. The current town of Bischofszell is first mentioned in 1155 as Bischoffescella. In 1250 it avoided being passed from the Bishop of Constance to the Prince-Abbot of St. Gall. In 1273 it was conquered the lords of Montfort, who burned the city. East of the castle a market and town grew up during the 13th Century. This new town around the market became the center of the modern city. The second enlargement began in 1360 when the noisy, smell or flammable businesses moved to the east of the town. Around 1405, this section was demolished for military reasons, and rebuilt, with a city wall, in 1437. The town seal of 1338 (gloved arm with crozier) and the Charter of 1350 testify to the beginning of the municipal government. The financial difficulties of the Bishop encouraged the autonomy aspirations of citizens, who often bought city rights from the Bishop. Bischofszell remained mostly independent under the Bishops of Constance. Starting in 1276 the Bishop's Chief Bailiff resided in the castle. He was the chairman of the twelve-membered City Council. The bailiff, with two leading members of the council, formed the high court of the city between 1485 and 1798. The high and low courts were not identical. The City Court had the low justice rights in the city and surroundings, while after the conquest of Thurgau by the Swiss Confederation in 1460 the Governor had low justice rights in part of the city, and high justice rights over the Heiliggeistspitals. After the Protestant Reformation, Zürich became the protector of the Protestant majority and attempted to protect them from the demands of the bishop. Complex political coalitions were created to govern Bischofszell. In 1587 a Confederation Vogt was appointed over the city, though the Prince Bishops retained power over the city until 1798. At the center of the old town, a city hall was built in 1626-29. The first city hall was destroyed in 1743 along with 70 other houses, in a fire. In 1747-50 a new city hall was built by Johann Caspar Bagnato (renovated in 1977-80). The entire population lived inside the city wall from 1437 until the 18th Century. In 1544-45 the cemetery was moved outside the walls. The castle was damaged by the city fire in 1419 and repaired soon thereafter. During the 17th and 18th Century the castle was expanded and totally renovated. The newly founded Canton of Thurgau took over the castle in 1798, but sold it in 1811 again. About 1838 the west part collapsed, and in 1843 the keep was broken up. Since 1930, the castle has been owned by the municipality. The village church originally belonged to the Sulgen parish. It became an independent parish in 1269. During the 14th Century, the newly built St. Pelagius's Church (oldest foundations were from the 9th century) was a collegiate and parish church. Under Zürich's influence most of the population converted to the Reformation in 1529, but by 1535 the Catholic Mass was again celebrated in the church. In 1536 and 1563 the parish funds were shared between the two faiths. Starting in 1728 all city offices were evenly split between Catholic and Protestant individuals. occupied by an even equally. The two parishes included Hauptwil, Gottshaus and Halden as well as parts of Hohentannen and Schweizersholz. Until the construction of the Reformed St. John's Church in 1968, the old church was a shared church. In 1530 a Protestant school was established. The Catholic School was closed in 1536 and reopened in 1660 with support from the Bishops, though since the late 18th Century it was increasingly supported by the city. In 1834 a secondary school opened in the town and in 1870 both religious school districts united. The wooden bridge on Thur (1300) and Sitter Rivers (from 1428) were replaced by stone in 1500. 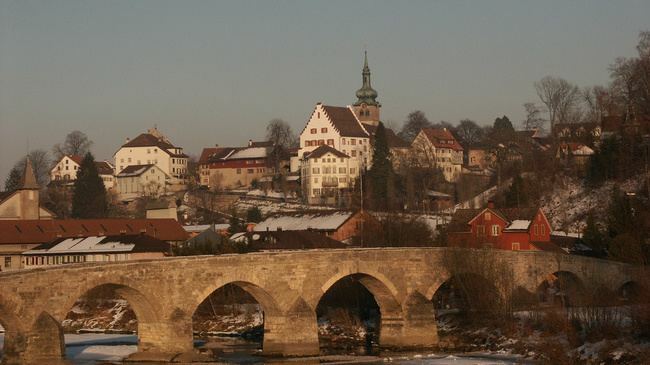 Because these bridges were exempt from taxes until 1796, Bischofszell became and important stop in the transshipment of textiles in the 15th-16th Centuries. It was quite successful in competition with St. Gallen and the Lake Constance towns. In the 17th and 18th Centuries the trading families of Rietmann, Bridler, Daller and Zwinger grew into powerful trading houses. The local textile production was, however probably of lesser importance. Crafts and trades protected their interests with restrictive decrees including the Gewerbeordnung of 1699 which prohibited guilds. Just as under the Ancien Régime, Bischofszell remained one of the richest municipalities during the Helvetic Republic. In 1812 the court of Engishalden and the hamlets of Winklen, Moosburg, Muggensturm, Klausenhäusli, Katzensteig and Im Stich were allocated to Bischofszell. The town spend approximately one third of their assets on the construction of the railway line from Sulgen to Gossau. Its opening in 1876 may have been crucial in addition to the water for industrial expansion. The first printer in Bischofszell the Thurgauer Druckerei founded in 1792 by Andrew Wehrli. From 1860 until 1872 they published the Bischofszell Zeitung and in 1870 published the Massschneiderei Munz. Between 1856-1911 the Jacquard weaving Niederer factory was active Bischofszell. Out of the Niederer factory, the paper mill (Papieri Bischofszell) grew and remained open until 1984. About 200 factory jobs offered in 1910 by two embroidery factories. The preferred industrial location in the 19th Century, was around the bridges. In the 20th Century the industrial park Bischofszell-Nord/Sittertal has drawn a number of companies. They include the cooperative Obi (1906) and Tobler (1909) canning factory, which since 1945 belongs to Migros. In the 1990s it employed about 700 employees and contributed to a positive commuting balance. Immigration changed the confessional (61% Reformed in 1870, in 1910 it was 55% and in 1990 only 40%) and political conditions, in the elections of the 20th Century, the Christian Democrats or CVP (or their predecessors) and the FDP were about equally represented, followed by the SP. However, in the 2007 federal election the most popular party was the SVP which received 39.53% of the vote. The next three most popular parties were the CVP (19.02%), the SP (11.33%) and the FDP (10.8%). In the federal election, a total of 1,537 votes were cast, and the voter turnout was 44.0%. The city water supply was built in 1893 and in 1903/08-59 it had its own gas production. In 1908 a storm water control system was built and a Sewage treatment plant was added in 1973, both of which improved the city's infrastructure. The city has expanded into the terrace area to the east, with the 1945-46 housing development that created "Obi-village", the detached houses on Lättehang and along the roads to Sitterdorf and Sulgen. After an exodus in the 1970s, population began to grow again in 1990. Bischofszell consists of two parts - the older elevated part and the newer more industrial part located to the north. The Sitter river flows in the Thur directly outside Bischofszell. The forest to the south-east and the riverbanks are popular recreation areas. The closest bigger city and capital of the neighboring canton St. Gallen is about 30 minutes away by train or car. Bischofszell has an area, as of 2009, of 11.62 square kilometers (4.49 sq mi). Of this area, 6.4 km2 (2.5 sq mi) or 55.1% is used for agricultural purposes, while 2.85 km2 (1.10 sq mi) or 24.5% is forested. Of the rest of the land, 2.06 km2 (0.80 sq mi) or 17.7% is settled (buildings or roads), 0.34 km2 (0.13 sq mi) or 2.9% is either rivers or lakes and 0.03 km2 (7.4 acres) or 0.3% is unproductive land. Of the built up area, industrial buildings made up 8.3% of the total area while housing and buildings made up 2.2% and transportation infrastructure made up 0.9%. while parks, green belts and sports fields made up 5.9%. Out of the forested land, 22.5% of the total land area is heavily forested and 2.1% is covered with orchards or small clusters of trees. Of the agricultural land, 47.4% is used for growing crops, while 7.7% is used for orchards or vine crops. All the water in the municipality is flowing water. The municipality is situated in Weinfelden District. It is located at the confluence of the Thur and Sitter Rivers, and includes the terrace south of the river. It consists of the town of Bischofszell-Nord/Sittertal and Bischofszell as well as Halden and part of Schweizersholz and Gottshaus (Stocken). Bischofszell has a population (as of December 2016) of 5,947 As of 2008, 22.3% of the population are foreign nationals. Over the last 10 years (1997–2007) the population has changed at a rate of -0.6%. Most of the population (as of 2000) speaks German(85.4%), with Portuguese being second most common ( 3.7%) and Serbo-Croatian being third ( 2.7%). As of 2008, the gender distribution of the population was 49.5% male and 50.5% female. The population was made up of 2,047 Swiss men (37.3% of the population), and 673 (12.3%) non-Swiss men. There were 2,221 Swiss women (40.4%), and 551 (10.0%) non-Swiss women. In 2008 there were 31 live births to Swiss citizens and 11 births to non-Swiss citizens, and in same time span there were 57 deaths of Swiss citizens and 2 non-Swiss citizen deaths. Ignoring immigration and emigration, the population of Swiss citizens decreased by 26 while the foreign population increased by 9. There were 2 Swiss men who emigrated from Switzerland to another country, 33 non-Swiss men who emigrated from Switzerland to another country and 31 non-Swiss women who emigrated from Switzerland to another country. The total Swiss population change in 2008 (from all sources) was a decrease of 26 and the non-Swiss population change was an increase of 24 people. This represents a population growth rate of 0.0%. The age distribution, as of 2009, in Bischofszell is; 507 children or 9.2% of the population are between 0 and 9 years old and 740 teenagers or 13.4% are between 10 and 19. Of the adult population, 744 people or 13.4% of the population are between 20 and 29 years old. 705 people or 12.7% are between 30 and 39, 915 people or 16.5% are between 40 and 49, and 693 people or 12.5% are between 50 and 59. The senior population distribution is 551 people or 10.0% of the population are between 60 and 69 years old, 391 people or 7.1% are between 70 and 79, there are 232 people or 4.2% who are between 80 and 89, and there are 58 people or 1.0% who are 90 and older. As of 2000, there were 2,198 private households in the municipality, and an average of 2.4 persons per household. In 2000 there were 656 single family homes (or 73.0% of the total) out of a total of 899 inhabited buildings. There were 92 two family buildings (10.2%), 51 three family buildings (5.7%) and 100 multi-family buildings (or 11.1%). There were 1,218 (or 22.5%) persons who were part of a couple without children, and 3,010 (or 55.5%) who were part of a couple with children. There were 249 (or 4.6%) people who lived in single parent home, while there are 42 persons who were adult children living with one or both parents, 12 persons who lived in a household made up of relatives, 43 who lived in a household made up of unrelated persons, and 129 who are either institutionalized or live in another type of collective housing. The vacancy rate for the municipality, in 2008, was 1.49%. As of 2007, the construction rate of new housing units was 2.2 new units per 1000 residents. In 2000 there were 2,516 apartments in the municipality. The most common apartment size was the 4 room apartment of which there were 736. There were 111 single room apartments and 355 apartments with six or more rooms. As of 2000 the average price to rent an average apartment in Bischofszell was 908.22 Swiss francs (CHF) per month (US$730, £410, €580 approx. exchange rate from 2000). 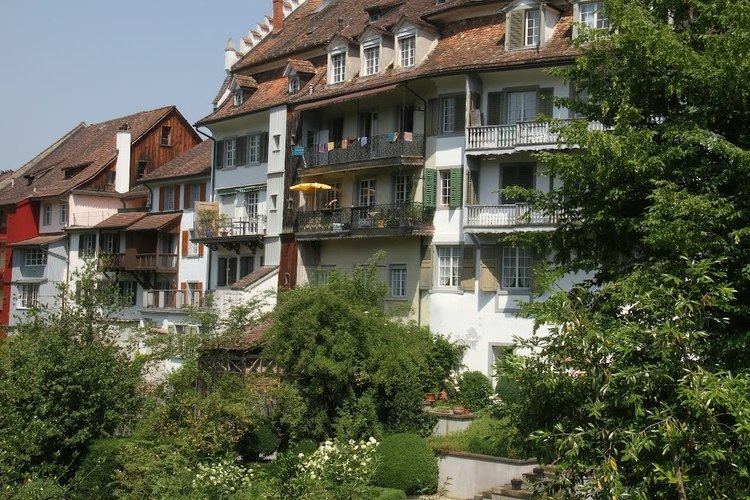 The average rate for a one-room apartment was 494.53 CHF (US$400, £220, €320), a two-room apartment was about 654.29 CHF (US$520, £290, €420), a three-room apartment was about 797.11 CHF (US$640, £360, €510) and a six or more room apartment cost an average of 1393.10 CHF (US$1110, £630, €890). 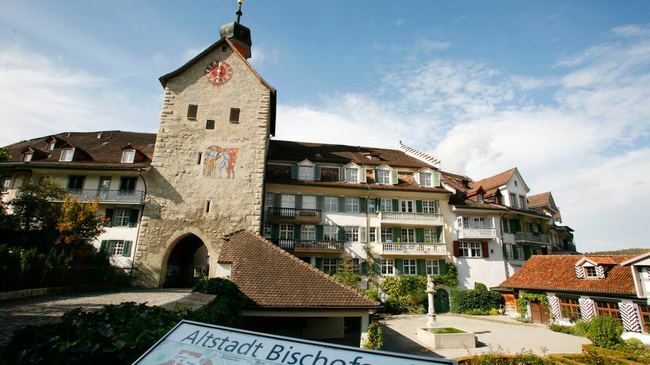 The average apartment price in Bischofszell was 81.4% of the national average of 1116 CHF. There are seven sites that are listed as Swiss heritage site of national significance. Two houses, the Daller House, the double house Rebstock / Rosenstock are included on the list, as is the former paper factory with paper machines. The house and the map collection of the Dr. Albert Knoepfli collection in the Museum Bischofszell, the Catholic Church of St Pelagius with St. Michaels Chapel, the Rathaus (Town council house) and Alte Thurbrücke make up the rest of the list. The entire city of Bischofszell is part of the Inventory of Swiss Heritage Sites. 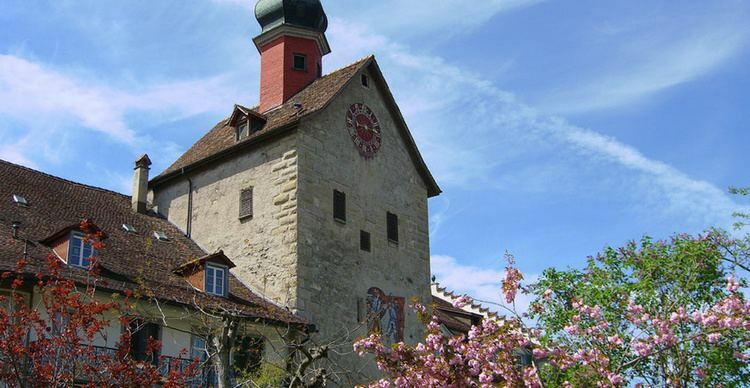 The Rathaus was built in 1747-50 by Gaspare Bagnato and is on Reichenau Island. The catholic parish church of St. Pelagius dates from the 9th Century. The old part of Bischofszell contains many historical buildings such as the eponymous former bishop's residence. During the annual "Rosen- und Kulturwoche" (roses and culture week) at the end of June a large part of this town section is decorated over 40 arrangements of roses and hosts cultural events such as concerts or balls. During Easter numerous wells in Bischofszell are decorated with Easter motives. The annual rafting race in May also crosses through Bischofszell. The large weir is an interesting spot in the race and the bridge directly above makes a popular place to watch the rafts. The "Thurbrücke" - one of the most notable bridges from the late middle-ages in Switzerland. The "Bogenturm" - the eastern gate and guardtower of the old Bischofszell. The reformed church building built between 1968 and 69 from designs by Benedikt Huber. As of 2007, Bischofszell had an unemployment rate of 2.4%. As of 2005, there were 117 people employed in the primary economic sector and about 40 businesses involved in this sector. 1,522 people are employed in the secondary sector and there are 66 businesses in this sector. 1,463 people are employed in the tertiary sector, with 196 businesses in this sector. In 2000 there were 3,612 workers who lived in the municipality. Of these, 1,283 or about 35.5% of the residents worked outside Bischofszell while 1,429 people commuted into the municipality for work. There were a total of 3,758 jobs (of at least 6 hours per week) in the municipality. Of the working population, 8.2% used public transportation to get to work, and 42.8% used a private car. "Bischofszell Nahrungsmittel AG" (Bischofszell Food Corp.) belonging to Migros produces a wide variety of products like fruit juices, jams, canned food, convenience food and non-soda beverages for the nationwide supermarket chain Migros and for export. "Molkerei Biedermann AG" (Dairy Biedermann Corp.) produces bio dairy products for numerous national (such as Coop and Migros) and international clients. From the 2000 census, 2,266 or 41.8% were Roman Catholic, while 1,895 or 35.0% belonged to the Swiss Reformed Church. Of the rest of the population, there were 2 Old Catholics (or about 0.04% of the population) who belonged to the Christian Catholic Church of Switzerland there are 104 individuals (or about 1.92% of the population) who belong to the Orthodox Church, and there are 218 individuals (or about 4.02% of the population) who belong to another Christian church. There were 4 individuals (or about 0.07% of the population) who were Jewish, and 409 (or about 7.54% of the population) who are Islamic. There are 15 individuals (or about 0.28% of the population) who belong to another church (not listed on the census), 308 (or about 5.68% of the population) belong to no church, are agnostic or atheist, and 200 individuals (or about 3.69% of the population) did not answer the question. The entire Swiss population is generally well educated. In Bischofszell about 64% of the population (between age 25-64) have completed either non-mandatory upper secondary education or additional higher education (either university or a Fachhochschule). Bischofszell is home to the Bischofszell primary and secondary school district.In the 2008/2009 school year there are 1,173 students at either the primary or secondary levels. There are 211 children in the kindergarten, and the average class size is 19.18 kindergartners. Of the children in kindergarten, 107 or 50.7% are female, 41 or 19.4% are not Swiss citizens and 44 or 20.9% do not speak German natively. The lower and upper primary levels begin at about age 5-6 and lasts for 6 years. There are 351 children in who are at the lower primary level and 396 children in the upper primary level. The average class size in the primary school is 20.19 students. At the lower primary level, there are 160 children or 45.6% of the total population who are female, 50 or 14.2% are not Swiss citizens and 52 or 14.8% do not speak German natively. In the upper primary level, there are 203 or 51.3% who are female, 65 or 16.4% are not Swiss citizens and 68 or 17.2% do not speak German natively. At the secondary level, students are divided according to performance. The secondary level begins at about age 12 and usually lasts 3 years. There are 246 teenagers who are in the advanced school, of which 132 or 53.7% are female, 28 or 11.4% are not Swiss citizens and 29 or 11.8% do not speak German natively. There are 172 teenagers who are in the standard school, of which 77 or 44.8% are female, 48 or 27.9% are not Swiss citizens and 57 or 33.1% do not speak German natively. Finally, there are 8 teenagers who are in special or remedial classes, of which 3 or 37.5% are female, 4 or 50.0% are not Swiss citizens and 3 or 37.5% do not speak German natively. The average class size for all classes at the secondary level is 19 students.